Chinese online shopping giant, Alibaba, has signed a Memorandum of Understanding (MoU) with GS1 Australia to formalise, promote and strengthen online trade between China and Australia. GS1 Australia is the largest issuing organisation of barcodes in Australia. 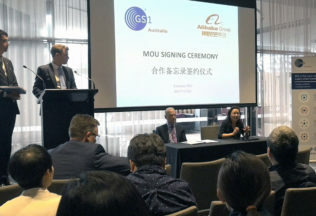 The MoU was signed by Maggie Zhou, Managing Director, Alibaba Group and Russell Stucki, Chairman of GS1 Australia, at an event in Melbourne on Friday 6 January 2017. Russell Stucki, Chairman, GS1 Australia said the MoU will formalise the strategic partnership to support the growth and introduction of Australian brands using GS1 standards. “The alliance with GS1 Global Office will also foster great opportunities for Alibaba to connect with over two million member businesses worldwide,” he said. “We are excited to enter into this agreement with GS1 Australia and support local businesses entering the Chinese market through Alibaba’s platforms,” said Alibaba Group’s Maggie Zhou. The MoU follows a Ocotober 2016 announcement from Alibaba and GS1 that they will be working together to standardise product information.